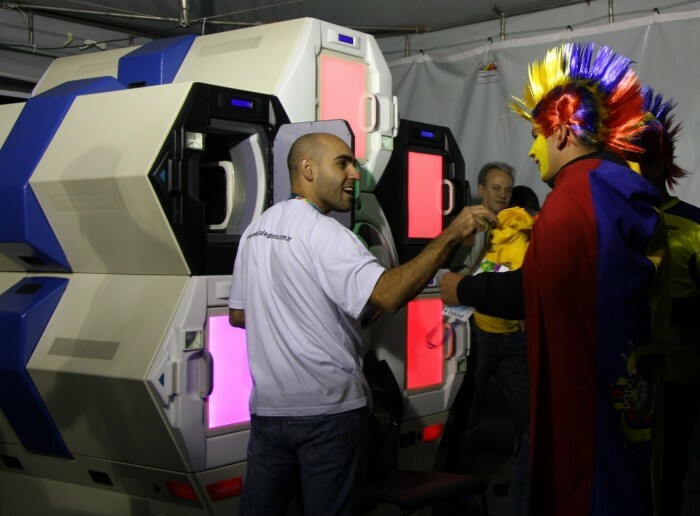 Qylur Security Systems, is a revolutionary, automated and self-service user experience, invented by the homeland security technology company based in Silicon Valley, who today announced that it deployed the Qylatron™ Entry Experience Solution for security screening at certain 2014 FIFA World Cup™ games. 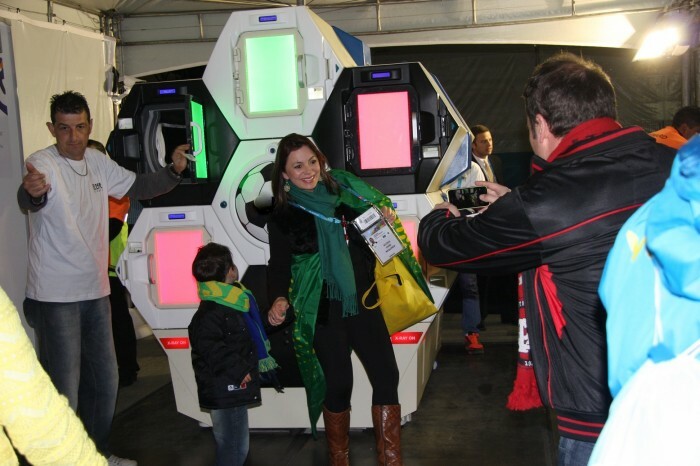 The solution was deployed at Arena de Baixada stadium in Curitiba, Brazil. Lisa Dolev, CEO and founder of Qylur, spoke again to the Sports Techie community blog about their sport business opportunity within the renovated Parana-state venue, perhaps the most modern and best-appointed soccer stadiums in Brazil, with a capacity of 43,900. Lisa was delighted about the overall “fan experience” at the Brazilian stadium that is located right in the middle of the city. 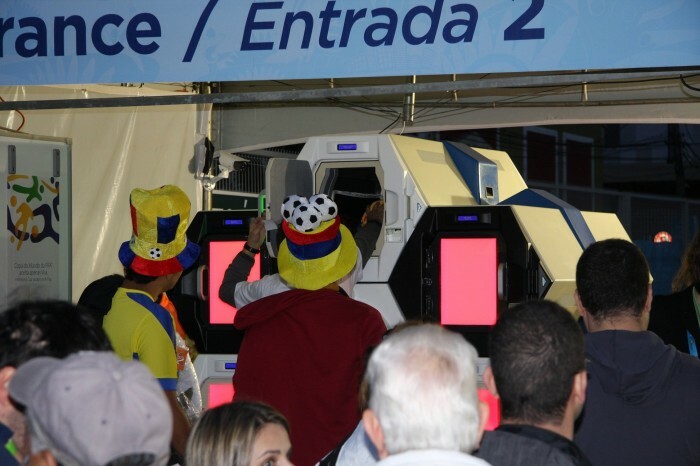 As a first, Agogo Marketing Promocional, the event operations company for the FIFA World Cup games in the cities of Curitiba and Salvador, contracted with Qylur to improve the security-screening experience for thousands of fans attending four group play matches at Arena da Baixada. Fans from Nigeria, Iran and Australia, plus Spain, Ecuador and Honduras, and Algeria and Russia, all enjoyed the full spectrum of the Qylatron. The 2014 FIFA World Cup security rules were stringent. Citizens were required to possess a “FIFA Access Card” while helicopters flew around and streets were blocked off kilometers away from the venue. No food or water was permitted to be taken inside the stadia, nor were big flags and horns. The plug-and-play feature of the Qylatron was a smashing success. They did not take apart the machine, instead a forklift was used to take it out of the box and set upon the floor as is. The system was set to run in the “Collaborative Mode” so the AI engine was used to identify certain dangerous items, while human operators focused on specific prohibited items. All water bottles and 25 other items were prohibited from stadium entry. The Qylatron was used for the “high priority” line. In addition to ensuring an expanded inflow of fans, the Qylatron – with its unique convenience features designed into the solution – also made it the top choice for servicing fans requiring special assistance due to disabilities, as well as seniors and young children. The colorful front and back panels of the Qylatron made for an attractive showpiece that helped the stadium stand out at the entry point, and also raised the overall level of fan enjoyment as they got to experience the security checkpoint of the future. Fans were fascinated with the Qylatron and many stopped to take photos and “selfies” with the striking entry system machine. The Qylatron solution is designed for sports and entertainment venues, monuments, and transportation hubs. Launched in late 2013 to intense global interest, the industry-first Qylatron entry-experience solution combines the initial greeting and ticketing experience for fans with security screening. The Qylatron scans guest tickets and screens bags with far greater efficiency than manual-driven alternatives, detects multiple security threats, reduces security costs with up to 50-percent less staffing, and improves the guest experience with a self-service concept. The Qylatron expedites and upgrades a venue’s security by performing five concurrent bag scans with patented, multi-threat detection that employs the fusion of multiple sensors. Equipped with an intelligent, threat-learning engine and ongoing updates, the Qylatron is able to respond to ever-evolving threats, both locally and globally. “This is especially gratifying as it validates the core principle of why I founded Qylur – to preserve human liberty while offering the most advanced security-screening technology in the industry,” said Lisa Dolev, CEO and founder of Qylur. Qylur Security Systems is a user experience-driven, homeland security technology company. Qylur develops fully integrated security-screening solutions (identification and bags) for large public venues such as sports and entertainment venues, monuments, and transportation hubs. Qylur employs patented, multi-threat detection that combines fused sensor technology, and an intelligent, threat-learning engine that responds to ever-evolving threats. Qylur’s products redefine public safety and deliver a true consumer-friendly experience, giving guests a fun, respectful, and personalized self-service process. Backed by top-tier investors and headquartered in Silicon Valley, Qylur has received the US Department of Homeland Security SAFETY Act designation. 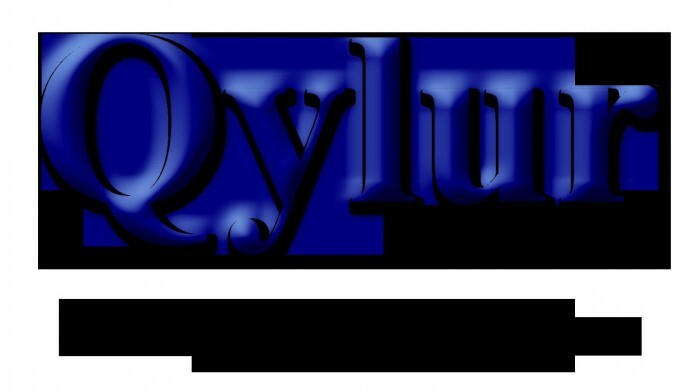 For more information, visit www.qylur.com. Sports Techie, For Lisa, the “Bottom Line” was her company proved “Big Time” that this diverse kind of International sports event, with a diverse mix of populations, cultures and languages, was a complete and massive success. According to Dr. Dolev, “The Qylatron is super upgraded security, beyond others.” She was, “genuinely thrilled” after arriving back to Palo Alto yesterday. “Payment was in line with the quality and services such a unique security machine calls for,” Dolev said. After reflecting, Lisa wished she had more time to create custom videos that covered 8 different countries and 10 different languages, but since the contract with FIFA was signed at the last minute, they could not produce these important videos that are used to greet the fans in their native language, helping to further ease a consumers bag checking experience. The Portuguese video was used to the delight of the host countries fan base. Since she was so busy ensuring the security kiosk operations, I wanted to know whether Lisa was able to watch any of the soccer matches played at historic Estadio Joaquim Americo. Lisa shared that towards the end of the tournament event in Curitiba, she caught some of a game but during all games, her team of heard the “roar of the crowds” during every play. 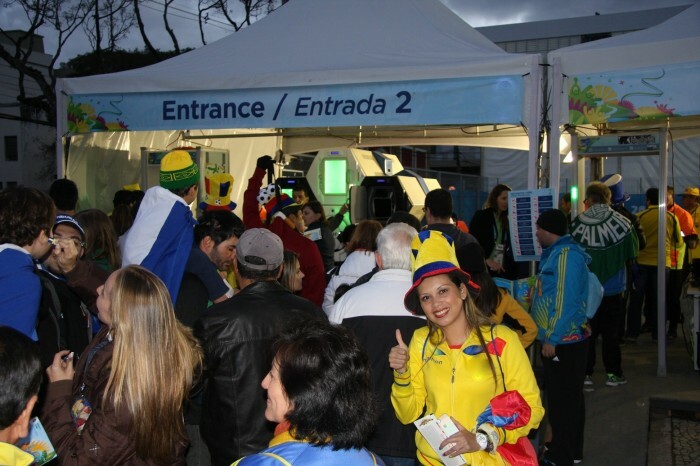 Together with all the fun face painting, the bag checking “fan experience” was an unprecedented pioneering success for FIFA. What is next for Qylur? Look for a monument, airport and the first sports team to sign on ideally before the end of the year. The NCS4 sent evaluators to inspect their security system. My gratitude goes out once again to Lisa for sharing her company’s business development opportunities with me so the Sports Techie blog readers can know about this historical sports tech story and achievement by FIFA, Agogo and Qylur.